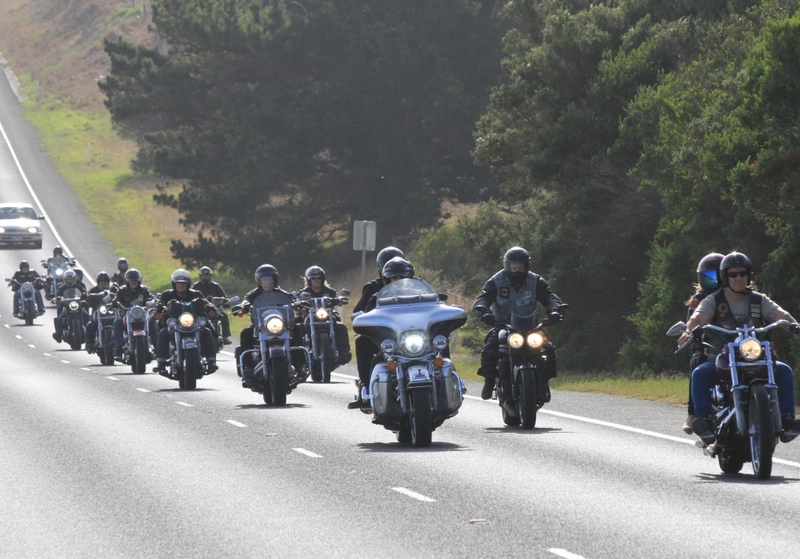 They came in their hundreds - bikers from Christian clubs like God's Squad and Longriders alongside those wearing the colours of so-called outlaw clubs like the Immortals and the Bandidos, to join in paying their final respects to preacher John Smith at a memorial service in the Victorian coastal community of Ocean Grove on Saturday. 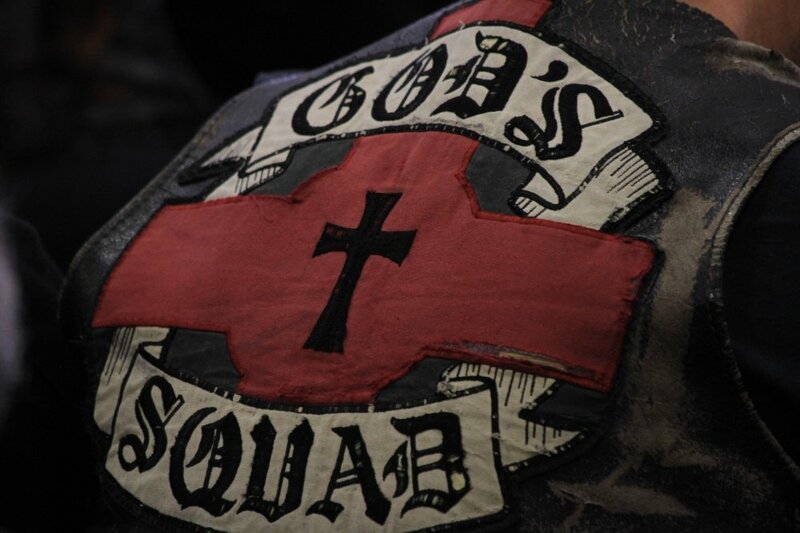 The bikies were among an estimated 1,500 people who attended the service held at the Wave Church to bid farewell to Smith - who founded the God's Squad Christian Motorcyle Club as an outreach to other clubs - after he died on 6th March at the age of 76 following a long battle with cancer. Smith, known to many simply as "Smithy", was remembered by those who gathered as a man who had ministered to the marginalised, as a pioneer of counter-cultural mission and as a John Wesley of his age with the impact of his ministry for the cause of Christ felt across the nation and beyond. 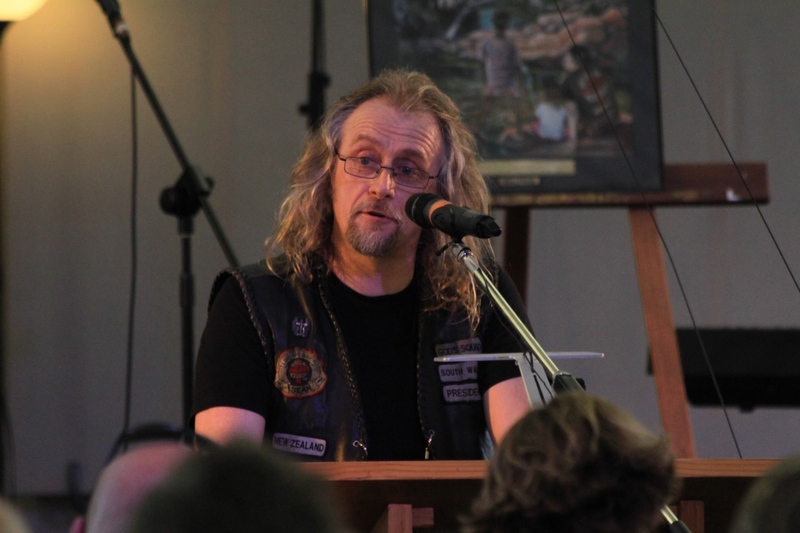 Representing the 400 members of God's Squad based in 16 countries around the world, Sean Stillman, a member of the club in south Wales in the UK and author of God's Biker: Motorcycles and Misfits, was among those to speak at the service, saying that as well as being pastor, preacher, academic, author, biker and music lover, he had been a "prophetic voice, an irritant to a comfortable church, an advocate for justice, the poor, the marginalised". "And more significantly John was a husband, father, grandpa, brother and uncle," he said, adding later that God's Squad sent their "deepest love and the assurance of our ongoing prayers" to Smith's wife Glena, his three children and their families, including 17 grandchildren. Above - John Smith in a screenshot of a video shown during the service; Below - God's Squad member Sean Stillman was among those who spoke at the service; Below - Many paid tribute to the role Smith's widow Glena (middle) had played in his ministry during the service. PICTURES: Tony Kerrigan. 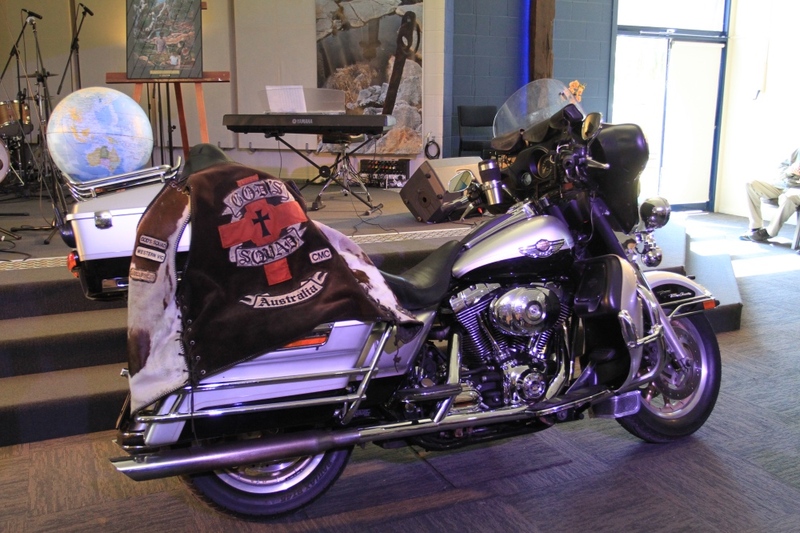 Stillman said that for Smith, the road on which he travelled hundreds of thousands of kilometres with God's Squad was a "place for discipleship and mission". "And like John Wesley, one of his mission inspirations, the world very much became his parish. It was where you worked out what it meant to be a follower of his hero, Jesus of Nazareth. The road would take you to the marginalised. He taught us that the Gospel still ought to be good news for the poor and uncomfortable news for the powerful. He remained passionate about the need for the message of Jesus to be faithfully proclaimed in the public sphere. But he also taught it us that it should be something that should be lived. Putting it into practice was not an optional extra." 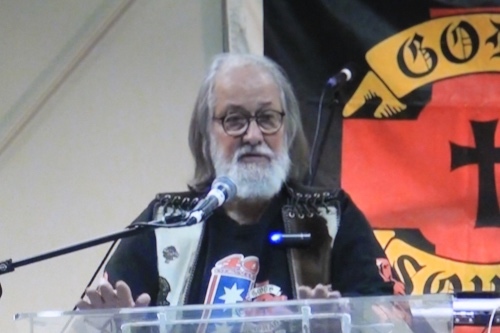 He also spoke of Smith's ability to connect with people in a myriad of contexts "whether it be in a smokey clubhouse bar, backstage at a rock 'n roll gig, or in the corridors of political power, a chapel pulpit, a street corner talking to a complete stranger, sitting amid Indigenous communities, engaging in academic dialogue or crying in the pouring rain at a graveside". Earlier, Stillman read an email from U2 frontman Bono in which the singer spoke of the how the man he called "John the Baptist Smith" quite like that "some churchy people" thought of him as a heretic - 'You mean like Jesus, matey? ', he recalled him saying - and how he viewed the Bible as an "incendiary tract, not some handbook on religion or a sop for mankind's fear of death but an epic poem about life" which spoke about culture, politics and justice. "When Bob Dylan sang 'always on the other side of whatever side there was, he might have been singing about John, an outsider in an outsider community, an outlaw of a different kind preparing the way for the coming of a different kind of world, speaking truth to power," Bono said, recalling how Smith, in their last meeting had spoken truth to him and given him a "hell of a hard time". "He thought I'd gone soft and become too comfortable round the powerful, thought I was living too well. He was probably right - I still think about it." 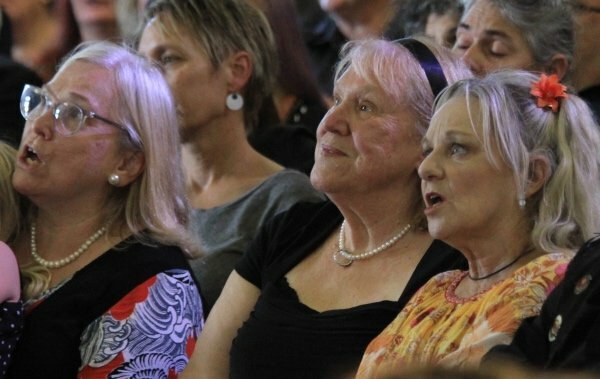 At least 1,200 people attended the service at The Wave Church on Saturday. PICTURE: Tony Kerrigan. Family members spoke of the man they knew as "daddy" or "Pa" including one grandson who recalled how Smith "always went that extra mile, especially for us grandkids". Smith's daughter Kathy recalled times playing with her father as a child. 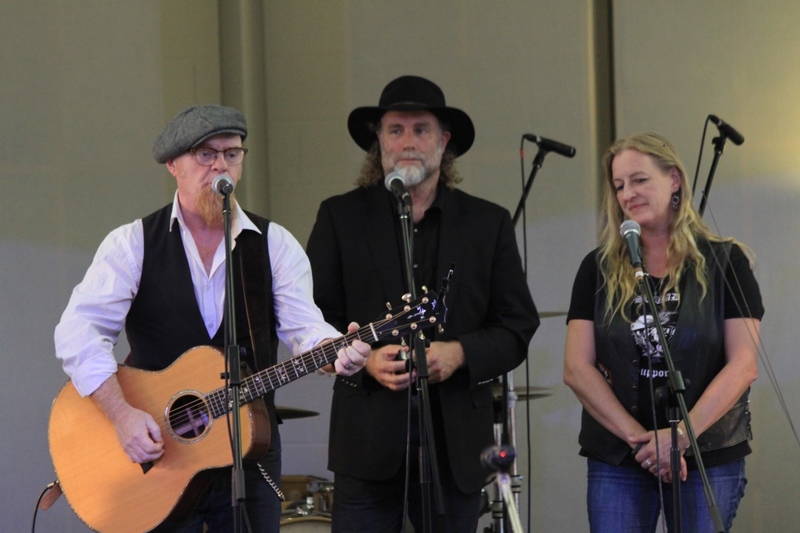 Above - Sean Stillman, of God's Squad in the UK, spoke at the service and devivered a message from Bono; Below - Sammy Horner, Steve Grace and Dianne Duursma perform at the service. PICTURES: Tony Kerrigan. "I have really precious memories of a fun dad that wrestled around and had fun with us," she said. "Awesome memories of holidays and so much he's taught us, to appreciate nature and all the little things." She said while it would be hard missing her father in the days to come, she was so grateful she and the family had been able to be with him at the end. While she said much of the service had been about a tribute to the "big JS", "I knew him just as Daddy." Earlier, South Australia pastor Ian Clarkson, who first met Smith on a "blistering hot" day when he was passing through South Australia many years ago on a God's Squad "sortie", said there was a great deal of "symbiosis" between John's ministry and that of John Wesley. He said Smith, by one calculation, had travelled some 2.25 million miles (3.6 million kilometres) "on not horseback like John Wesley but on his motorbike". "Wesley did some 225,000 miles on horseback and preached 40,000 sermons. I reckon John would probably had eclipsed that here in Australia," he said. So, he was on the road and the nation was his parish..."
Clarkson said Smith's ministry, like that of Wesley's, was focused on those who were on the "edge of society". "John went to those who were left out, who were on the margins, who were sometimes despised, who sometimes didn't know where they were at for all sorts of reasons." Aunty Jean, an Aboriginal Christian leader from south-east Queensland, paid tribute to Smith's friendship with the Aboriginal community, recalling his "real heart for justice" when he came to meet with Aboriginal leaders at the Commonwealth Games in Brisbane in 1982. "[I] trust that all of us will be challenged today will be challenged by John's life and the impact that he's made upon this nation," she said. "And I'm meeting people all across this nation who have been impacted by John's ministry." Steve Drury, who worked with Smith's ministry for 10 years from the mid-1980s, said he found Smith "compelling and hard to ignore". He said that over the 10 years he had witnessed Smith minister to hundreds of thousands of people face-to-face and millions more through media around the world. And as well as conducting mission events and public speaking in Australia and elsewhere, he had also been an advocate for human rights. "John put himself at risk - in the Philippines, Central America, Eastern Europe..." he said, recalling in particular the time Smith and a colleague were arrested while protesting the demolition of homes by local militia on the Philippine island of Mindanao. Well aware of the need to meet with people where they're at, Drury said Smith spent thousands of miles and hours "going to where people, lived, worked or socialised, listening and engaging on their own terms". Drury said Smith had a "deep understanding of culture" as well as empathy for people, an ability to craft messages and engage people and a love of music. "Constantly challenging, constantly rewarding, it was an honour to work with John Smith. John challenged all of us as indeed he challenged himself..."